15.11.2018, Hünenberg – Today, the industry-leading premium Swiss sports apparel brand KJUS, unveiled the word’s first garment to feature an electronic, user-controlled membrane. The ground-breaking wearable technology – HYDRO_BOT, integrated by KJUS into a ski jacket, actively pumps out sweat from inside the jacket to keep skiers dry, warm, and performing at their best. KJUS’s 7SPHERE HYDRO_BOT ski jacket actively pulls sweat away from the inner garments and out of the jacket using a process called electro-osmosis. This overcomes the issue of sweat becoming trapped inside a skier’s clothing system, and the dreaded post activity chill that results from having saturated inner garments. The technology not only boosts the enjoyment factor but also the performance factor, by ensuring the skier spends minimal energy on thermoregulation and maximum energy on their ski performance. The HYDRO_BOT technology is incorporated into the jacket via two panels strategically located on the high-sweat zone of the back. The technology consists of 3 functional layers; a membrane made up of trillions of pores per m2, surrounded by conductive fabric. When a small electrical pulse is applied, the pores turn into micro-pumps, actively pumping sweat away from the body and out of the jacket quickly and efficiently. Ultra-simple to use, the jacket can we switched on and off with the integrated control unit or via Bluetooth from the iPhone & Android compatible app. 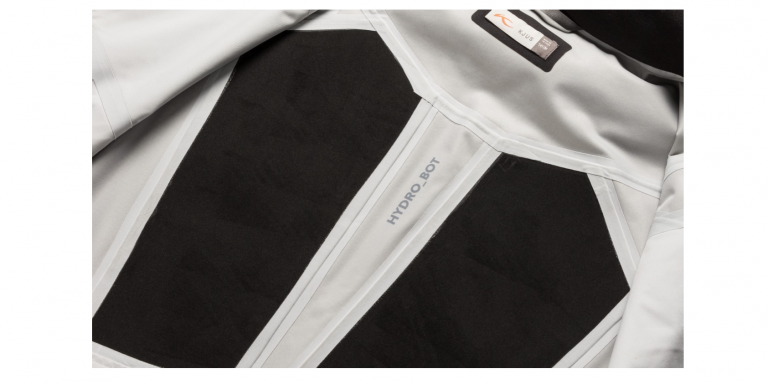 The revolutionary HYDRO_BOT jacket is up to 10 x more efficient than jackets with regular membranes, and is not adversely affected by freezing temperatures. It is the first ever garment to be able to match human sweat rates in terms of breathability. In fact, the more moisture the skier produces the faster it works. By measuring the amount of sweat passing through the panels the app is also able to make practical recommendations on how to regulate body temperature, enabling skiers to minimize sweat production in the first place. Developed and patented by Swiss technology company, Osmotex, HYDRO_BOT is a game-changer for the industry and the first significant innovation since membranes were introduced 40 years ago. Research and developed over a period of 10+ years in collaboration with the Swiss research institute EMPA (the Swiss Federal Laboratories for Materials Science and Technology) and fabric developer Schoeller this is the first application of the HYDRO_BOT technology within a garment. The 7SPHERE HYDRO_BOT Jacket will initially be available for men only and retails for CHF 1599 (£ 1299 / € 1399 / $ 1699). It will be available for purchase on www.kjus.com and through KJUS stores and select retailers from December 10th. It can be reserved online from November 22nd. User-controlled: on-demand moisture management at the touch of a button. Smart Sweat Management: Actively sweats out moisture keeping you warm and dry from the first run of the day to the last. Revolutionary: The only jacket to be able to match human sweat rates in terms of breathability. Moisture Transport: The panels actively pump out moisture from inside the jacket when an electrical pulse is applied. Body-Zoned: HYDRO_BOT panels are strategically located on the high sweat zone of the back. Beat the Chill: Prevents your inner garments from being soaked with sweat and the post-activity chill that results. Super-Efficient: Up to 10 x more efficient at reducing moisture inside your jacket than traditional membranes. Weather Independent: Unlike traditional membranes HYDRO_BOT gives you high performance even in sub-zero temperatures. Performance Boosting: With less energy spent on thermoregulation you can spend more energy on your ski performance. Sweat Monitoring: By measuring the amount of sweat passing through the panels the app is also able to make practical recommendations on how to regulate body temperature. User-Controlled: Use the iPhone and Android compatible app or the jacket’s control box to turn HYDRO_BOT on/off.